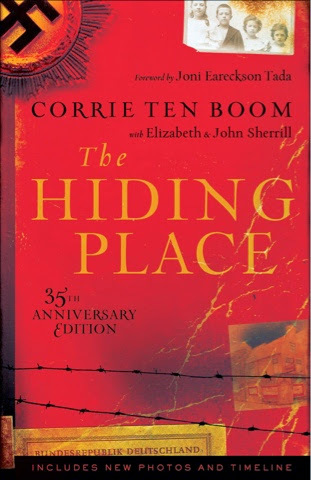 I can still remember the first time I read The Hiding Place. It was twenty-three years ago. I have read more than a dozen of Corrie's books since. This one left an indelible impression on me that helped me see more clearly the tender love of Jesus. The raw honesty about her struggles and the simple trust in God that is displayed here is such a beacon to my soul. I don't know about you, but I wish the world could be full of Casper ten Booms. The patriarch of the ten Boom family was so full of a graciousness that I deeply long for. I long to see it in my brothers and sisters in Christ. I'm sure that many of you have read this. I read it in school. I don't think it would be allowed in this day in age. It spoke in such a deep way to me because I often felt as though I were in an emotional prison growing up. I often prayed with the psalmist that God would set me free from my prison so that I could praise His name. He answered me. As I re-read it, I was struck many times of how much it resounded with me over and over. The simple way that these people opened their doors to people and let them into their family reminded my heart of the call to open our home to others. They just invited them in. They were not trying to be perfect or impress them, they were simply showing love to any one created in God's image. In the midst of reading this, I had to laugh. Can you imagine this group of old, feeble people running the underground smuggling ring? If you ever wondered if you could serve God where your at, here is proof that we can do anything if we trust God. I just love the picture of Corrie on her Clandestine bike rides, rims wrapped in cloth, to meet up with the secret smuggling operation. I love how she stated at the end of the book that nothing could have compelled her to take such great risks but the Holy Spirit. I cried many times through this book. Often due to human atrocity and hate. Many times because of the beautiful, gracious spirits that Christ cultivated in the ten Boom family. Once because of how she missed Betsie who died in the prison camp. It brought up a longing for my own brother who died in a different sort of personal prison. Reading at last what Christ had used Corrie to accomplish is astonishing. Her houses for healing Jews. She was able to turn one of the concentration camps into a place of healing for Germans who were homeless due to the bombings. I love that God gave her the vision of being taken away and Betsie the vision of bringing healing. He reminds us that He is with us wherever we go. He reminds us to be thankful for everything, even fleas. He reminds us to serve one another even in disgusting circumstance. May our hearts be challenged to this glory in Christ. I too read this book years ago and was changed by it. You have written so beautifully - and have reminded me to read it once again. Thank you for your beautiful BlogSpot.